The Project Diva series of rhythm games is its own kind of beast. It marries a brutal difficulty level with the most saccharine Vocaloid-centric J-Pop one can imagine. At its center is a familiar heroine: Hatsune Miku, the turquoise-pigtailed, eternally teenaged virtual pop-idol extraordinaire. She’s a one woman singing, dancing, performing machine, and to top it all off, she’s not human and she never will be (which is even the subject of one of her songs). Instead, Miku is endlessly sculptable to her fans’ desires, an ever-changing hunk of perfectly auto-tuned clay. Whether the result is fan art, cosplay, fan fiction, or independently produced songs, Miku is both the muse and the canvas for anyone who creates with her. 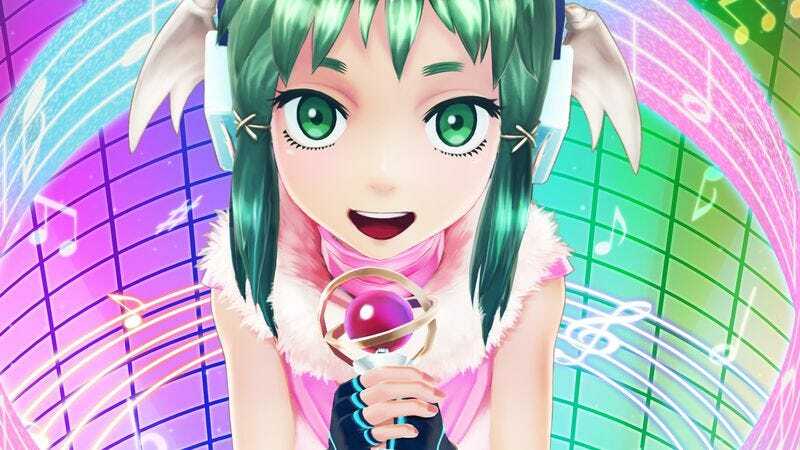 She’s the most prominent face of all virtual idols and Vocaloids, and in Atlus’ latest game, Tokyo Mirage Sessions ♯FE (TMS) on the Wii U, the developers created their own little homage to the Miku phenomenon—but with a twist. Their Vocaloid is a living, conscious being. Tiki is a “mirage,” one of the many Fire Emblem-inspired characters that lend their magical powers to TMS’ star, Itsuki, and his dungeon-crawling party of aspiring idols. Her Fire Emblem incarnation was a being with unfathomable hidden power. In TMS, she’s just a kid who’s noticeably younger than the rest of the cast. Tiki doesn’t ride into battle alongside Itsuki and company as the other mirages do. She’s relegated to a behind-the-scenes support role, similar to Rise in Persona 4. The player can visit Tiki in the “Bloom Palace,” an alternate realm that she is unable to leave and where she’ll provide upgrades to your weapons and abilities. Tiki also happens to be a pop idol of a sort. Her image was borrowed as the basis for an Uta-loid (TMS’ answer to Vocaloids and their software) in the real world. There, Tiki’s Miku-like persona is prime for the adoration of thousands of followers, but Tiki herself has no part in orchestrating her “own” work. She’s not an active participant in her music, merely an image existing as a muse and tool in the real world. Uta-loid Tiki has a rampant fan base, much like Miku, some of whom even get their start in music production by using Tiki’s image and perfectly pitched auto-tuned vocals. One such acolyte is the quiet, headphone-adorned Tiki=Waifu (yes, that’s her “name”), a longtime fan and one of the most popular creators of Uta-loid Tiki’s music. The deadpan producer has even made a fan of the real Tiki, although Tiki=Waifu remains blissfully unaware of her physical existence. When Tiki=Waifu goes missing, Tiki shows genuine concern and urges Itsuki to find her at all costs. She sends incessant texts asking about the mysterious producer’s whereabouts and when she’s found, expresses profound relief and gratitude. The Project Diva series of Hatsune Miku rhythm games attempts to form a bond between the player and the virtual pop stars, but it treats its idols more like pets than human beings. You can feed Miku and her four companions snacks and drinks, and if they’re pleased, they glow with happiness. You can also pet their heads, much to the virtual beings’ delight. In the end, it’s more reminiscent of Nintendogs than a life simulator like The Sims. Still, glimmers of the Vocaloids’ personalities come through in these arbitrary mini-games. Armed with such simple information as their likes and dislikes, alongside the typical styles of their unlockable costumes, I found myself decorating their homes in a fashion I believed they’d enjoy, adorning rooms with specific posters and Nendoroid-looking figures. The player’s personal connection to Miku and friends ends there, though, otherwise manifesting only through what they project onto Miku. But TMS follows the proven format of Shin Megami Tensei, a vast series of role-playing games known primarily for its multifaceted characters and darker themes. Here, Tiki’s given the room to be Tiki. She cheers on Itsuki and his friends from afar, sending encouraging texts and adorable Line-like digital stickers while the crew is off battling beasts in the mysterious dimension known as the Idolasphere. Tiki treats Itsuki like an older brother, and opens up to him in ways she doesn’t with the rest of the crew. She has a personality. She genuinely cares. She has fears. She gets lonely. She even has dreams, like leaving the Mirage world and performing a concert in ours one day. Toward the end of the game, that wish briefly comes true. After Itsuki composes a song for her, with Tiki=Waifu’s help, and acquires a stone belonging to her from a boss fight, Tiki is given a true physical form. For the first time, she has a sense of touch. Her feet touch the ground, and she embraces Itsuki happily, begging him to take her on an adventure to the outside world. He obliges, but not before watching and smiling as Tiki performs her first concert. This show sounds very different from Tiki’s music we’ve heard in the past: There’s no auto-tune. For the first time, she is in control of her destiny. This is the real idol singing, and her Uta-loid is left in the dust. Before long, though, her dream day in the real world ends, and Tiki returns to the Bloom Palace. In a later scene, as Itsuki is undergoing composing lessons from Tiki=Waifu, the obsessive producer reviews his song. “It’s as if you’re talking about Tiki like she exists,” she scoffs. “That’s quite the imagination you have—not as much as mine, though.” That’s the beauty of virtual idols like Miku and Tiki. Their possibilities are endless because they thrive on crowd-sourced imagination. Just as there can be a rude and stubborn Miku in one story, there can exist a sweet and humble Miku in another. Her origins are blurry for the sake of second-hand creativity. Tokyo Mirage Sessions isn’t quite a course correction to Miku’s canon-blandness. If anything, it’s a gentle nod to her thousands of different lives. Tiki’s is just another story, one of a virtual idol with a rare history and a life that’s wholly her own.